Researchers in the US have come up with a new trap design for bed bugs. It could help unlucky holiday makers detect these unwelcome travel companions before an infestation takes hold. Experimenters from the Department of Entomology compared a new "pitfall" trap design with the current market leader, a shallower-sided plastic trap. Their new trap was actually an upturned plastic dog bowl, covered with surgical tape that had been dyed black. In a laboratory setting, they found that their trap had a 77% probability of capturing bed bugs released, whereas the shallower trap only had a 23% probability. They also compared the devices in single bedroom or studio apartments occupied by 'one elderly person'. In this realistic setting, their dog bowl trap caught nearly three times as many bed bugs over 28 days, compared to the market leader. Chemical 'lures', known to appeal to bed bugs, made the traps more effective. The researchers had previously found that a combination of nonanal (a chemical often used in perfumes), 1-octen-3-ol (an alcohol found in human breath and sweat), spearmint oil and coriander Egyptian oil was attractive to bed bugs. They baited one trap with this and compared it to an identical trap without bait. The baited traps were more effective both in the lab, and in an occupied apartment. The insects are also known to be drawn to carbon dioxide. Attaching CO2 cylinders to traps is expensive, and there are risks of it leaking. These researchers compared the effectiveness of CO2 canisters with yeast and sugar. This combination creates a fermentation reaction, releasing CO2 at a fraction of the cost of a gas canister. There was no difference in trap effectiveness between the two, suggesting that traps can use this cheap method to release CO2 and lure more bugs. These findings are good news for those who have unwittingly brought bed bugs back from their travels. A better trap design can allow people to detect bed bugs while they are still in small numbers. Lead author Narinderpal Singh said: "If you have only 10 or 20 bugs in your apartment, it's very hard to see with your eyes. When people realise they have bed bugs they are often already in their thousands, or hundred thousands. It's relatively easy to eradicate the bed bugs when they are in small numbers, but when they are everywhere, it's very hard to eradicate them." Not only that, but these devices could be created at home very cheaply. Singh says "the lure is already in the process of licensing by two pest control companies…but the rest of the trap you can make at home. Active monitors [those which use CO2, chemical lures, or heat to tempt bed bugs] are very expensive, but sugar and yeast, maybe it would cost $2". There are various clues that can give away an infestation. Not everyone reacts to bites, but some people might get itchy red bumps on their skin. 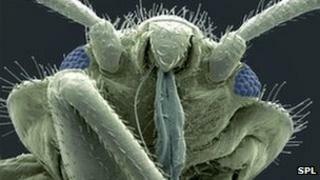 They may leave black spots of faeces on mattresses, or blood smears if a bed bug that has recently eaten has been squashed. Bed bugs shed their shells every so often, so might be visible. Sometimes the actual bugs, which look a bit like lentils, might reveal themselves. They are oval shaped, flat, reddish brown, and about 5mm long. Singh advises those who think they might have an infestation to seek professional help: "These devices are designed only to detect. And then you have to call the professionals."